President Trump speaks during a Cabinet meeting on June 12, 2017. 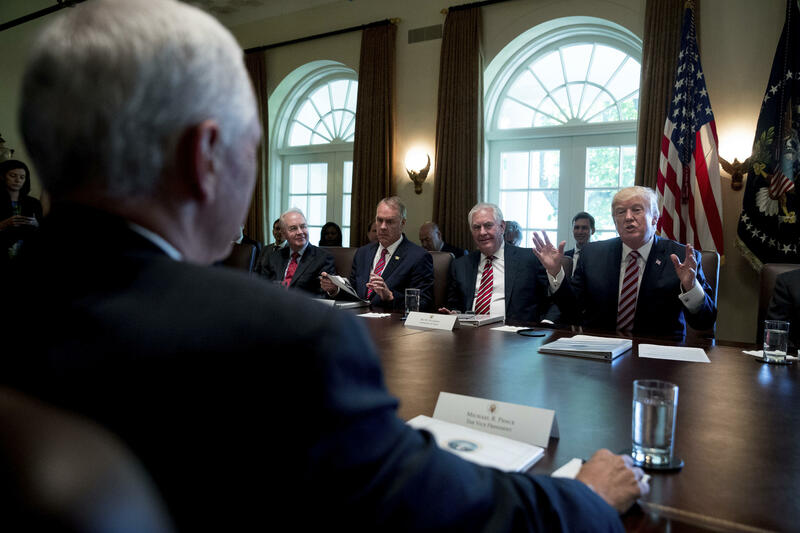 From left are, Vice President Pence, foreground, then-Health and Human Services Secretary Tom Price, Interior Secretary Ryan Zinke and Secretary of State Rex Tillerson and the president. Price was fired by Trump last year, Tillerson was fired on March 13. Trump's willingness to say "you're fired" (or to have someone else say it) to so many people, so early in his administration, is just another way Trump is unlike those who have come before him. In addition to his Cabinet, the churn in top-level staff in the Trump White House is also off the charts. "There will always be change, and I think you want to see change," Trump said on March 15, not quite tamping down the latest rumors of possible Cabinet departures. "And I want to also see different ideas." In just 14 months on the job, Trump has had more Cabinet turnover than 16 of his predecessors had in their first two years. With Shulkin's exit, Trump has now tied Ronald Reagan, who had four Cabinet departures — and they all came well into his second year in office. The four Cabinet members Trump has already replaced are Health and Human Services Secretary Tom Price, who was pushed out after controversy over flying in charter aircraft; Homeland Security Secretary John Kelly, who became chief of staff over the summer; Secretary of State Rex Tillerson, who was fired by tweet recently over policy and personality clashes; and now Shulkin, who had been embattled in recent weeks over both policy disagreements and an inspector general's report that found he improperly had taxpayers cover travel expenses for his wife. Several other members of the Cabinet are either clouded in controversy over possible misuse of public funds or otherwise earning the ire of President Trump. Other presidents with early Cabinet turnover saw departures for entirely different reasons. Herbert Hoover's first war secretary, James Good, died suddenly 258 days into his tenure. Franklin D. Roosevelt's first treasury secretary, William Woodin, fell ill, writing after just nine months on the job, "The state of my health will not permit me to remain in this position." He died a few months later. Over the approximately 100-year period reviewed for this story, there were Cabinet shake-ups and shuffles, secretaries who departed to take on new roles either in the administration or on the Supreme Court. There were resignations amidst policy disagreements, and perhaps most remarkably there was an agriculture secretary who served in the job for less than 90 days, while waiting to take office as governor of West Virginia. Typically in the first two years, a president has his dream team Cabinet in place and they are working hard to enact his vision. Then midterm elections come, people get tired and Cabinet shake-ups begin. "Other presidents wanted to save face for themselves and not look like their Cabinet is in disarray," said public policy professor James Pfiffner, explaining one of many possible reasons for the typical early stability in presidential Cabinets. Pfiffner, who specializes in presidents and their Cabinets at George Mason University, also says most presidents have a political background and choose Cabinet members they know and are compatible with who have long-established histories navigating Washington, D.C. Trump's original Cabinet included a number of outsiders, perhaps most notably Secretary of State Rex Tillerson, who came from Exxon Mobil and who Trump didn't know beforehand. "President Trump doesn't pay much attention to tradition or usual decorum or norms of the presidency," Pfiffner said, pointing out that Trump puts a premium on personal rapport. "And so he does what he feels like, and continues to." For this analysis, NPR looked at the first two years of Cabinet departures for presidents going back to Woodrow Wilson. We didn't count holdovers from previous administrations (especially prevalent when a president took over following a death or resignation), instead focusing on Senate-confirmed secretaries in each president's first two years and how long they lasted. Which jobs are considered Cabinet positions has changed over time, so we opted to use the same definition as the U.S. Senate historian. This means Trump's chief of staff and CIA director aren't part of the count, and neither is the administrator of the Small Business Administration (a position presidents Clinton and Carter had to refill early on).